ANONYMOUS. -Leaf from a French Missal. ANONYMOUS. - Leaf from a French Missal. Leaf from a French Missal. - ANONYMOUS. Title : Leaf from a French Missal.. Date : France, probably Rouen ca, 1450. Size : 13.4 x 9.6 inches. / 34.0 x 24.5 cm. 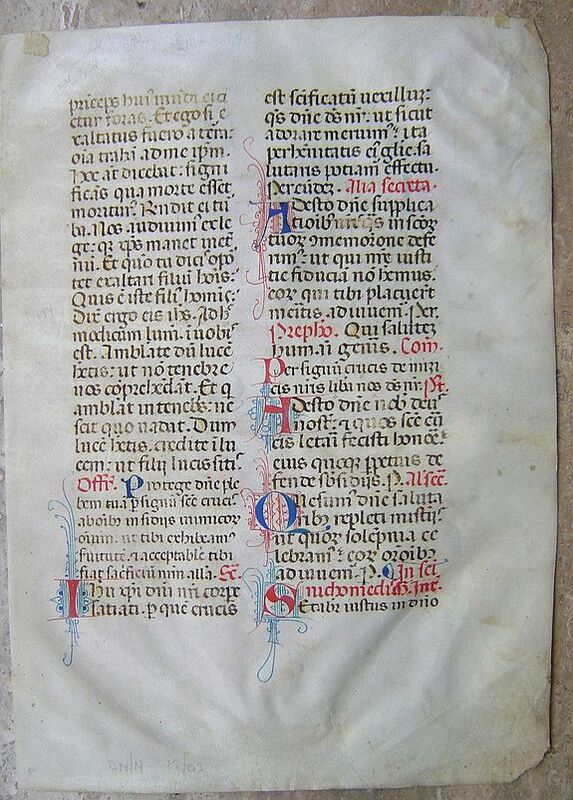 Large leaf from a French Missal, on vellum, written in dark brown ink, parts of the text in red ink. 29 lines in two columns. The missal is a service book containing the texts necessarry for the performance of the Mass.It was introduced in th Carolingian period and by the thirteenth century had supplanted the older sacramentary. RECTO: Seven 2-line initials in red or blue and infilling with the contrasting colour and penwork sprays along the sidelines.Size of text 230x160 mm. VERSO:five 2-line initials in red or blue, infilling with the contrasting colours and penwork sprays along the sides. Size of text 230x160 mm. Condition : The leaf is clean condition, though the vellum is slightly cockled, more so in two corners.